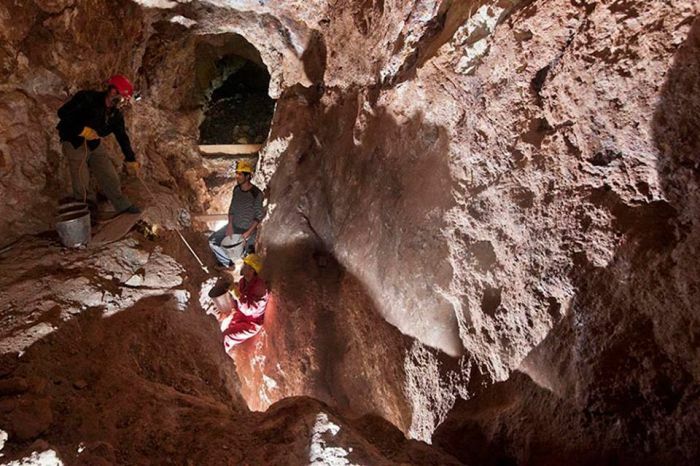 When the German-Georgian expedition has discovered the real age of the Sakdrisi-Kachagiani gold mine for the first time nearly ten years ago it was a surprise: and it is still as many scientists are asking what about the metal that has been won at this mine: how was it consumed and where it was transported to? These questions are still a matter of scientific debate and they may perhaps stay as such for a longer time in future. Archaeology has many mysteries that cannot even be solved even by one scientific generation. But sometimes a lucky scientific find provides us with first clues to understand the treacherous archaeological record. During the recent investigations on Caucasian gold it was possible to work on golden spiral- rings from a rich Kura-Araxes-tomb found near Hasansu in West Aserbaijan (Museyibli et all. 2012)1 (Fig.8.5); the grave dates to the later stages of Kura-Araxes culture and was therefore a hot candidate to prove the usage of Sakdrisi gold as it is chronologically contemporaneous with the younger phases of the gold mining in Sakdrisi (recently Stöllner et all. 2014: 80-82): the sampling and geochemical investigation did indicate strongly the probability that the gold derived from the Sakdrisi deposit (see M. Jansen et al. in: Stöllner et all. 2014: 106-107). This evidence is not a conclusive result but more the beginning to raise further questions: Why is the metallurgical record especially of the early Kura-Araxes culture before 3000 BC so sparse? How does this fit to the appropriation and cultural use of metals within the early EBA-societies in that region; how and why prestigious metals came into use and what kind of cultural aspects was interwoven with the practice of producing and consuming these metals? These are far-reaching questions that need to be considered from the side of metallurgy and metal use and from the side of production. 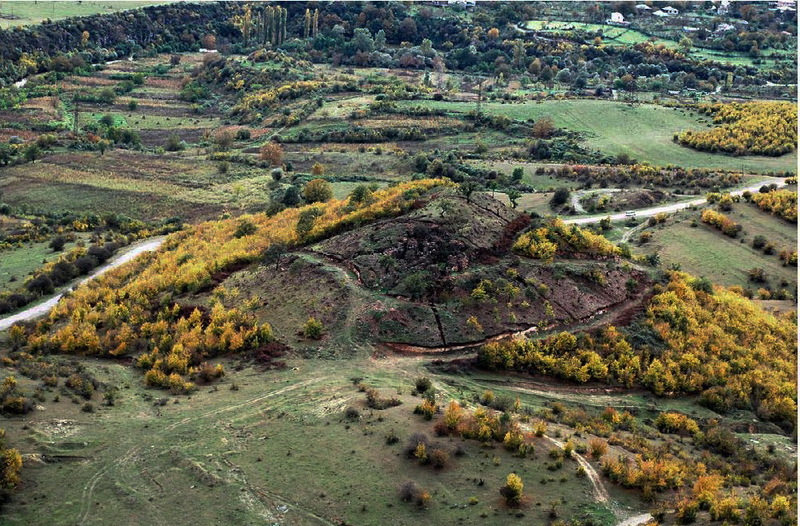 While the discussion on the earliest metal use has been going on for some time now (for the research history: Courcier 2014: 580-584) it is different with the production of which we have one well studied example in the Mashavera valley near the famous metal deposits of Bolnisi and Madneuli. Besides the very early metal objects that have been discovered in layers of the Neolithic Shulaveri-Shomutepe-culture (e.g. Kawtaradze 2001; recently new finds from Aruchlo; S.Hansen in Lyonnet et all. 2012: 84-85) we realize that from the beginning of the 4th millennium metals became used to larger extend in East Georgia and the whole Transcaucasian region. But still metals occur seldom in late Chalcolithic settlements of the Sioni/Tsopi group (recently Nebieridze 2010) and they do even to a lesser extent at the beginning of the Kura-Araxes culture. An increase of metals is particularly visible in contexts of the later Kura-Araxes culture after the turn to the 3rd millennium (Fig.1). When looking this sequence in more detail it is apparent that the appropriation of metals and metallurgy has not developed in a straight line. After a first invention phase in the 6th and the 5th millennium with a comparatively limited use of metals and ores (Kawtaradze 2001) their use slightly increased in the 1st half of the 4th millennium, with a first emphasis on the younger stages the late Chalcolithic cultures (Leilatepe-cultural complex); in east Georgia but also in Azerbaijan Kura valley we find first metallurgical inventions that became so common later during this millennium (in general: Courcier 2014:623-636; Gambashidze et all. 2010). First heavy metal tools also occurred (e.g. a Mesopotamian shaft-hole axe from Orchosani) and first arsenical bronzes and Nickel rich bronzes as well as first precious metals such as gold and silver (Courcier 2014; Gambashidze et all. 2010). 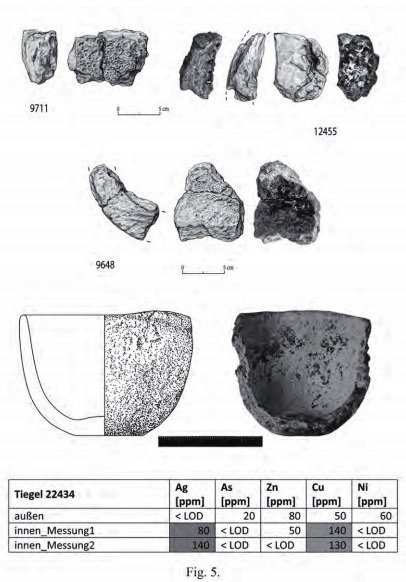 It is certainly not by mere chance that these metallurgical innovations were in line with others (chaff tempered, brownish wares, and “wheel turned” pottery of Uruk/Leilatepe style: in general recently summarizing: Helwing 2012). This horizon of - in the widest sense - “Mesopotamian” innovations can be observed in various parts both in the northern Caucasus (Maykop) and in the eastern plains of the Kura and Arax-rivers (Murgab, Mil-Steppe, e.g. the so called Leilatepe-culture: Akhundov 2004; Museyibli 2007; older concepts: Munchaev 1975; for metallurgy:Courcier 2014). It is interesting to note that especially the later phases of the chalcolithic Sioni/Tsopi group as recently discussed by Nebieridze (2010) produced also the first evidence of tumulus-graves in the Kura-valley and its tributaries (Soyuq Bolaq: Lyonnet et all. 2010; Boyuk Kesik N4: Akhundov- Makhmudova 2008; Kavtiskhevi: Makharadze 2007). This stands in line with other already mentioned innovations and may indicate the rise of higher demand of metal products. As recently discussed for West Azerbaijan especially the late chalcolithic levels of settlements like Berikldeebi (Javakhishvili 1998; for the metals: Gambaschidze et all. 2010, Nr.17-27), Mentesh Tepe (A. Courcier in Lyonnet et all. 2012: 109-113), Poylu and Boyuk-Kesik (Museyibli 2007) produced a larger amount of copper and arsenical-copper artefacts and especially also metallurgical implements like crucibles and moulds. These finds are parallel to 4th millennium technical ceramic that is well known in a large area between the Upper Euphrates, Northern Mesopotamia and the Iranian plateau (recently Helwing 2012). Best examples for this metallurgical tradition were recently discovered by T. Akhundov at the site of Alkhantepe: Several moulds, crucibles and interestingly also litharge strongly remind on parallels from Tappeh Ghabrestan (Majidzadeh 1979; recently the finds: Stöllner et all. 2004) or Arisman (Helwing 2010)2. As recently Helwing (2012) and Ivanova (2012) have underlined, there might have been direct connections that especially contributed to the rising metallurgical tradition at the beginning of the 4th millennium in the Lesser Caucasian regions. And as the graves of Seh Girdan in North-Iran indicated even a long time ago: these contacts had several facets and were vice-verse (Muscarella 1969; 1972). It is therefore rather likely to hypothesize the introduction of technical knowledge by specialists alongside the large river streams of Kura and Araxes to the Lesser Caucasian highlands. In contrast it is astonishing that metal from second half of the 4th millennium is not as abundant as one might expect especially in the archaeological record; one is surprised how little the amount of metals in the archaeological record is. In Georgia we have only a few dozens of metal findings from the early Kura-Araxes period and they do not differentiate from the earlier late Chalcolithic in principle. There were arsenical copper alloys but most abundant copper that contains a broad impurity pattern and traces of various chemical elements. This shows that this copper was smelted likely from regional poly-metallic ores-deposits (for Mentesh Tepe see: A. Courcier in: Lyonnet et all. 2012: 109-119). But the archaeometallurgical record does not show any special metallurgical innovation before the end of the 4th millennium BC neither in East Georgia nor in Armenia or in West Azerbaidjan. It seems the central Transcaucasian area remained on a rather late chalcolithic metallurgical tradition. This rather reluctant relation to metallurgy and the deposition of metals of metals suddenly changed during the end of the 2nd stage of Kura-Araxes. The time around 3000 BC saw an enormous increase of metals. This makes clear what E.N. 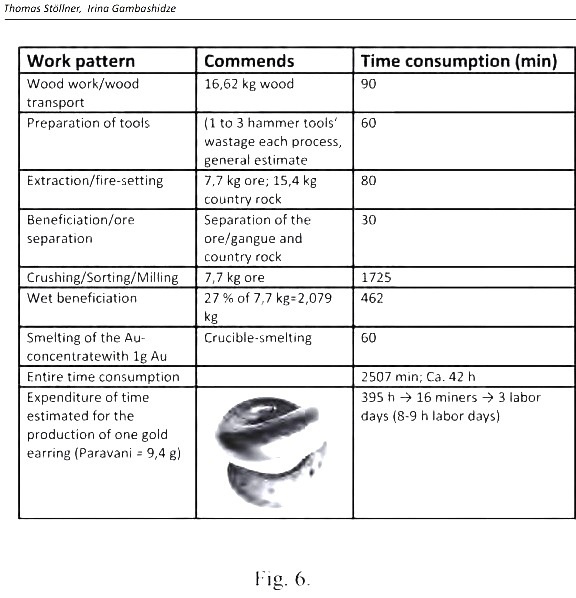 Chernykh already stated years ago: the difference between metal- rich Maykop and the metal-poor Transcaucasian Kura-Araxes in the later 4th millennium does certainly not mirror their actual metallurgical activities but rather their ritual practice with metals (Chernykh 1992: 73; in a similar sense in regard of gold: Japaridze 2013, 13). From the time around 3000 BC and the first half of the 3rd millennium BC we earn more than ten times as many metal objects as in the 2nd half of the 4th millennium. But not only has the quantity increased but also the variation in alloys: as in other regions of the Near East we find a lot of new metal compositions during that time; it seems that the experimental use of metals (and colors respectively) did result in various metal compositions: the “rich” tomb of a socially significant woman at Kvazchela (N2) (Javakhishvili- Glonti 1961; Fig.2) is a very good example: like the famous “royal tomb” from Arslantepe (Frangipane et all. 2004) the whole grave was furnished by a high variety of metal-alloys of several kind: the diadem and the bracelets are both consisting of arsenical copper, an alloy that was already known in the 4th millennium but now came to an ubiquitous level of use: in the contrary to the late Chalcolithic and early Kura-Araxes period arsenical copper was now used at nearly the same level as copper. While the bracelet and the diadem had rather low arsenical level we see the contrary with a number of beads that consists of an arsenical component up to 25%. This resulted in a shiny greyish, silvery color (Gambashidze et all. 2010, Nr.118). It is quite likely that the high arsenical alloys that have occurred in the Transcaucasus during that time originally were intended to imitate silver. A good example derives from the Armenian Kura-Araxes settlement of Gegharot where a necklace with conical and cylindrical beads, bag-shaped pendants and double volute pendants had been found: All of them consist of high arsenical alloys of which the bag-shaped ones had even high additions of lead (Meliksetian et all. 2011:208, Fig.8). A special note should be given therefore to silver in general that also occurred for the first time during that period in the archaeological record of Georgia: earlier evidence is known from Soyuq Bulaq (Lyonnet et all. 2010; Courcier 2014: 623-626; Gambashidze et all. 2010) in west Azerbaijan but these examples remained rather unique. The question certainly arises with the silver if it was cupellated either from rich polymetallic ores or if native silver was used: In regard to the evidence of Alkhantepe (see above) it would be logical to assume the cupellation technique and its transmission via the Kura-valley-system from the east. In Georgia there is no litharge found yet neither in the 4th nor in the 3rd millennium’s record. But there are interesting indications for a possible application of this technique from the famous site of Amiranis gora. There the excavators discovered lead and silver spirals (Chubinishvili 1963), the latter also containing lead to a minor content (unpublished results). The sudden rise of silver certainly and high arsenical bronzes goes together with another regional specialty: the antimony. Most of the time it is allotted to arsenical copper alloys but very seldom it is known as a pure metal. Antimony beads also have been found in the already mentioned grave of Kvazchela. However, quantitate level of the antimony component in metals but also the evidence of pure antimony objects indicate its deliberate use at least since the first half and mid of the 3rd mill. (Hauptmann- Gambaschidze 2001; Gambashidze et all. 2010, Nr.363-364): it has been often underlined that regional Antimony deposits especially those from the Ratcha area in Western Georgia played an important role (for the mining: Maisuradze-Gobedischwili 2001): the 3rd millennium examples do indicate their exploitation already by late Kura-Araxes communities: it may be noted that Kura-Araxes settlements expand into the valleys of the Greater Caucasus already in the later 4th mill. BC: it is therefore not astonishing to find antimony especially in Imeretia –Satshkhere and in Kura-Araxes settlements in Shida Kartli -Dzaghina, Kvazkhela, Tvlepias Zkharo (Gambashidze et all. 2010. pp.123-127). These prestigious alloys go together with the first gold-objects and especially their shiny equivalent, the first tin-bronzes; both occurred still rather rarely. There are only a few gold “spiralrings” (so called “Schläfen- or Lockenringe”) from this period discovered in the surrounding of Satchkhere in Imeretia (Gambaschidze et all. 2010, Nr.277; 427). They derive from graves and so does the pair of golden spiral-rings from the metal rich grave in Hasansu in West Azerbaijan (Museyibli 2012). This stands in a line with tin-bronzes that we only know from further few sites in East Georgia, West Azerbaidjan and Armenia: besides older finds from Delisi3 a spiral-ring from tomb in Talin (a tin-bronze with a comparatively high Ni amount) that can also be dated at the end of the 4th millennium has to be mentioned especially (Meliksetian et all. 2011, 204): according to its Pb-isotopes at least one of the alloying components should derive from an geological older deposit: as such deposits are not known in the TEMP (Tethyan- Eurasian metallogenetic belt) the tin or even the copper should have been imported from abroad (Meliksetian et all. 2011, pp 208 Fig.16): it often has been discussed if such “old” deposits can be connected with Central Asian tin sources but this discussion has not come to an end right now (Pernicka 1998; Pernicka et all. 2003). Finally we have to add some words about the subsequent Martkopi/Bedeni stages of the Early Bronze Age that either can be understood as final stage of the Kura-Araxes-development that now is characterized by variations in ceramic styles and the occurrence of a new group of socially significant tombs, the early Kurgans. According to recent dating it is likely to envisage the transition around the mid of the 3rd millennium somewhat between the 27th to 24th century BC (Kavtaradze 2004; Kohl 2007: 108). However, it is interesting to look also to the abundance of metals that are known from this period: Arsenical coppers were dominating the record during this period while copper and tin-bronzes were represented on a rather limited degree: what is surprising is the high ratio of precious metals that were discovered in many of the extraordinary rich kurgan tombs from the Trialeti plateau, from Martkopi and from the Alazani valley (for the gold-finds see e.g. Gambaschidze et all. 2010, pl. 1-6).According to recent studies of M.Jansen and A.Hauptmann many of the gold artefacts are characterized by a higher level of silver: one might discuss if especially the silver rich gold artefacts of this period were either alloyed or products from placer or rock-gold deposits that contained a high silver portion (such as the Armenian Masrik district: Wolf et all. 2013)4. Besides the strong dominance of prestigious metals it is obvious that the Martkopi and Bedeni metals followed the later Kura-Araxes metallurgical traditions: still there are various alloys and metals which are typical for the region such as objects of antimony. What has been found in Georgian metals is a higher level of lead in tin bronzes what makes it likely that lead was used to enable easier casting. If we summarize our knowledge so far at hand it became obvious that there are several phases of metallurgical inventions during the fourth and third millennium BC: at least the rise of metallurgy during the Late Chalcolithic period at the beginning of the fourth has to be mentioned. But even the transition from the late 4th to the early third millennium showed new alloying techniques that found its climax during the period of the early kurgans. But what is less clear is the provenance of these metals and how these inventions and their social background triggered a demand to exploit regional sources or even were driven by the use of regional sources. Especially if we look to the earlier phases of the Kura-Araxes culture the extreme scarcity of metals is striking: if we look for instance on mining sites from that period we can resume that this rather may result from a filter of transmission; it may not directly reflect the real use of metals in the second half of the 4th millennium. One should not forget that even the Martkopi/Bedeni kurgan’s metal furnishings do provide us with a blurred picture. Therefore it may be useful to look again to the production of gold at the central Mashavera-valley in Kvemo Kartli and discuss its consequences for our discussion. 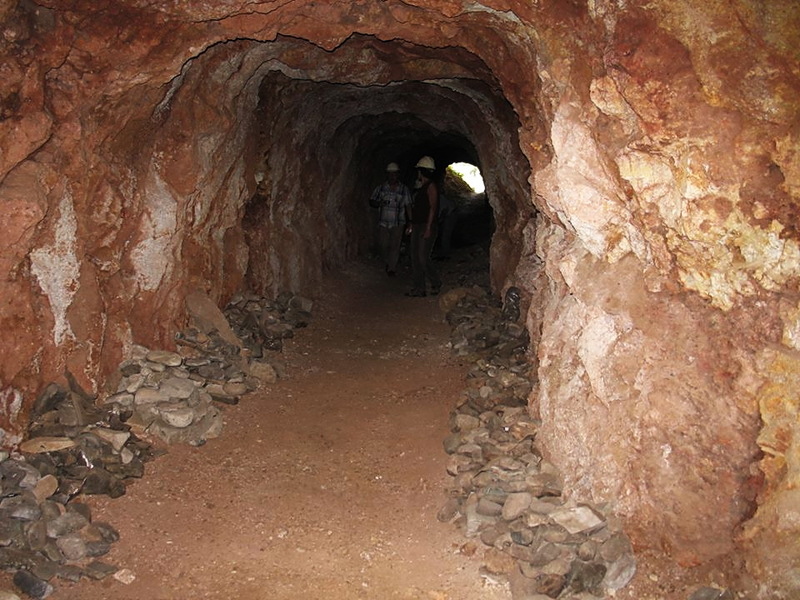 The prehistoric mine of Kachagiani-hillock was first described by the engineer and geologist T.P. Mujiri; the site was then called Abulmug and Mujiri made valuable observations about the stratigraphic contexts of stone-hammers within refilled mining galleries (Mujiri 1987, 57 pp, 91 pp, 111 pp; commend Stöllner et all. 2010, 109). He was also the first who hold possible a prehistoric gold mine. In 2004 the ongoing modern research started by a joint Georgian-German team; the group that consisted of mining archaeologists and archaeometallurgists continued an interdisciplinary field research until 2013 within 8 field seasons (Fig.3). Excavations were commenced mainly at two mining structures (mine A and B) (in general already Stöllner et all. 2010; 2014); these mining structures can be characterized as refilled opencast mines that led once to underground parts; in the case of mine A it was possible to excavate these mining parts also in the underground where the ancient galleries were intersected by the galleries of the modern exploration mine. 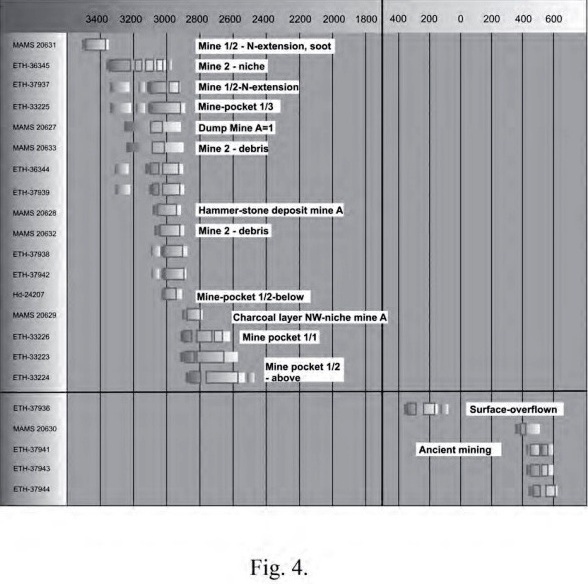 Excavation and subsequent dating of mining debris establishes a clear chronology: the mines had been used during two phases: the older phase can be dated by several 14C-dates to the 2nd half of the 4th millennium and to the beginning of the 3rd millennium (Fig.4) (Stöllner et all. 2014:79-81 Fig.7). 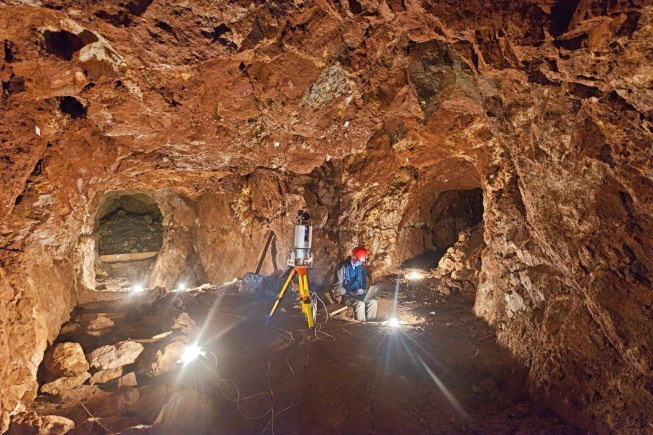 It has reached depths of 24 to 31 m below surface and was refilled in the lower parts completely by contemporary mining debris; the younger phase in the contrary can be described as a reopening of the old mines: the activities reached depths of around 8 to 9 m below surface (in detail: Stöllner et all. 2014: 76-80 Fig.8). According to single charcoal-dating from those younger debris it is likely that this secondary work step took place between the 5th and beginning of the 7th century AD. Considering the fact that nearly all the debris had been refilled after the mining process it is interesting that the Kura-Araxes miners refilled their galleries carefully with different beneficiation debris from up the ground. This conclusion is cogent as the single gallery followed the single ore veins nearly without interconnections so the access once was only possible from the mine mouth. 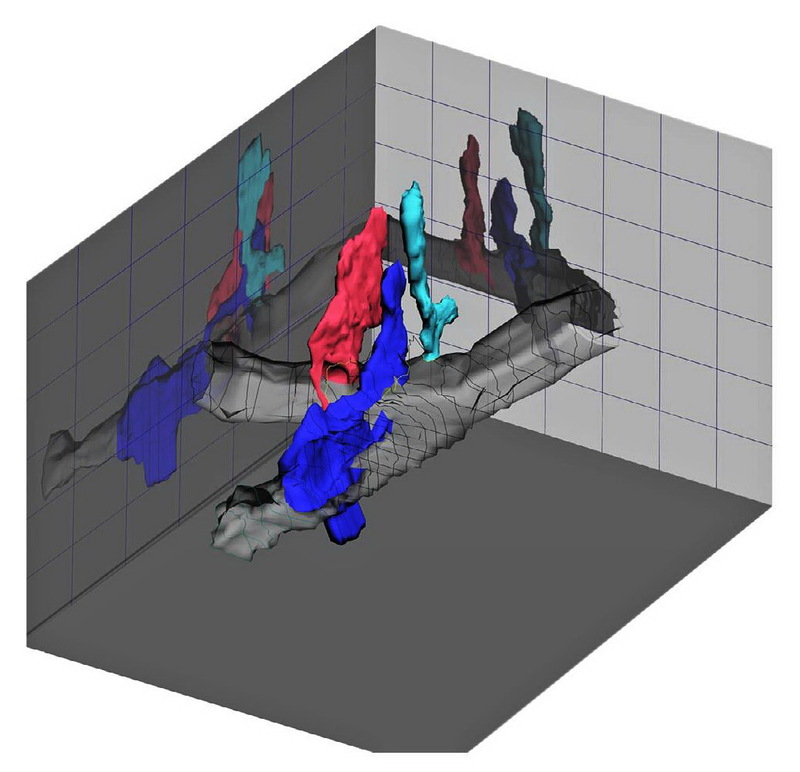 At the current state of evaluation a general 3D model allows to follow the various underground structures: in principle all the mining cavities had been developed by removing the original ore-body (ores and gangue) and the accompanying host-rocks; the mining technique can be described as a “following the vein”-system which was advanced in a diagonal way: the underground mines 1 and 2 provide good examples for this technique which mainly applied the principles of fire-setting. 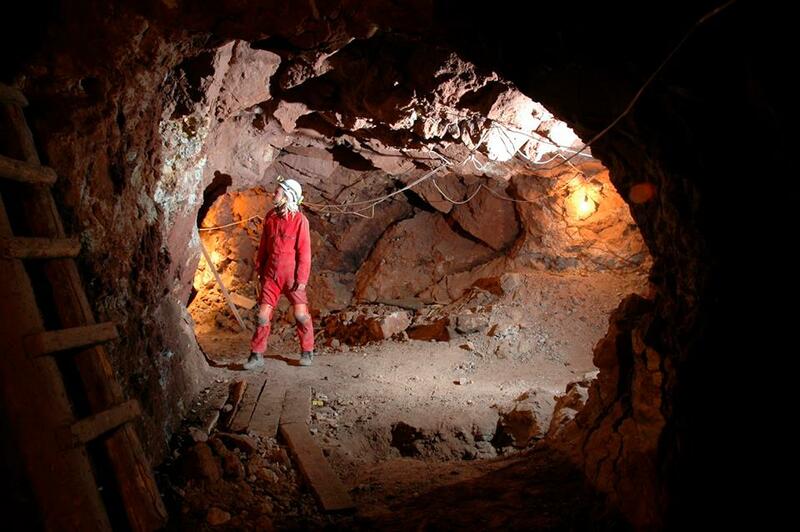 The fire always had to be lid at the working-edge within the ore body and as the miners are forced to follow the veins to the depth the mining process led to diagonal galleries that went down in steps and pedestals. When analysing all the available mining parts of the Kura Araxes period it is clear that the ancient miners followed most of the richer veins to the depth by creating horizontal and slightly inclining working levels; the most demanding working step was the sinking of the initial gallery part in order to construct a new working level that later could be advanced easier to the lateral. The reconstruction of the “chaîne opératoire” is an ongoing process requiring a trans- disciplinary approach of material sciences, archaeology, ethnology and experimental archaeology. The process reconstructed so far can be compared with techniques described for antique and younger periods (Agricola 1556; see also Tylecote 1987; Bachmann 1999). Despite this empirical approach many questions remain open that pertain to technical solutions and quantitative aspects such as the time-span and the yield of different production steps; together with the estimate of the gold once produced these questions are essential to understand the social impact that the gold exploitation once had (see in detail Stöllner et all. 2014). 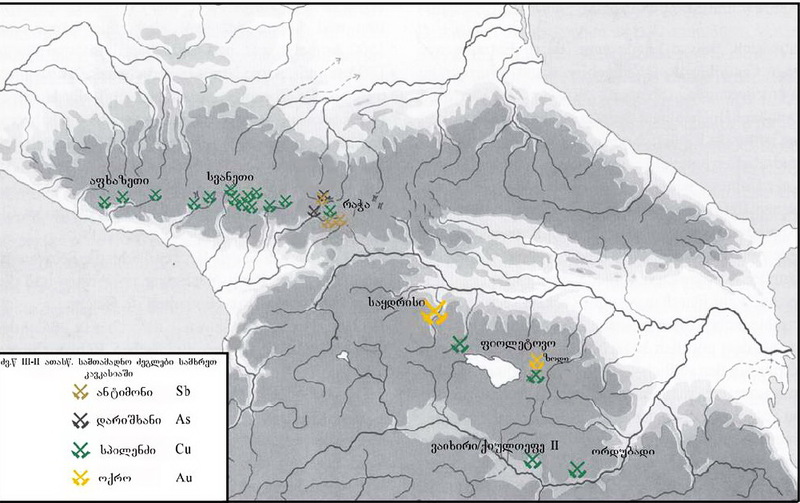 Besides the ore-production the gold-production consisted of several steps that had been documented by archaeological observations, by artifacts and by features (Stöllner-Gambashidze 2011:196; Stöllner et all. 2012; Stöllner et all. 2014). Three of those procedural steps mentioned above can be located at the gold mine of Sakdrisi: especially those steps have been also simulated by experiments to understand single technical solutions (e.g. Stöllner et all.2012). They were undertaken in 2011 and 2013: the focus was particularly set on the mining, sorting and crushing and milling process of ores as well as the panning of the gold concentrate. Once the ore was crushed and sorted most of the high quality gold bearing coarse sands were transported to locations where this material was fine grinded. The results of Dzedzvebi house 3/2009 made apparent that this ore milling was done in large workshop rooms at the settlement (Stöllner et all. 2014:95-100 Fig.24). Having found also gold contents of about 1 ppm in this workshop room (and being considerably elevated in comparison to the surrounding) proves the workshop and milling theory. The abundance of mill-stones found there does this also in general. Whether the sands got washed and fire-assayed in crucibles in the end is till now a likely but unproven hypothesis. Till now no gold containing crucible was found. 2010 a crucible was found in a pit of the early 4th millennium (together with late chalcolithic pottery) (Stöllner et all. 2014: 102 Fig.21). The metallurgical crust of the crucible shows a slight enrichment of silver; the levels are similar to the silver content of the ore-deposit in Sakdrissi, while the copper is not enriched (Fig.5). An even more interesting site has been unfolded in 2014: in a workshop of the Kura-Araxes period dozens of milling and anvil-stone were found in context with crucible fragments and several pits: on pit even contained the original ash filling in which a crucible was still embedded (Stöllner et all. 2014: Fig.21). It seems likely that the whole feature represents a non-permanently used workshop area in which gold ores were grinded and subsequently smelted. Further investigations will show not only the metallurgical details but also if such sites represented a typical pattern of work-organisation within the Kura-Araxes settlement occupation of Dzedzvebi. In order to understand the social impact that the gold production once had, we had to calculate as well as the general gold-production and the societal and technical efforts of the gold production. Let us start with the estimation of the gold production: as the mines were refilled again with mining debris we were calculating the amount of gold that once left behind and sum it in comparison to the amount of gold that we found still in the single veins that have been exploited. According to our investigations several data could be achieved: first of all there was information about debris ores above ground and refilled mining debris underground (Fig.6); there the gold-grade allows insight into the cut-offs of the gold-productions; a general mean of 1 ppm Au can be regarded as a minimum-number of which could not be removed from the deposit (calculations in detail: Stöllner et all. 2014, Tab.3-4). On the other hand there is the average gold amount per each of the gold bearing quartz-hematite veins: a case-example will be given here for the lowest mining part of mine 1/2 (called the North-extension): besides the volume and the general ore-content (approximately a third of the volume: 32 m3 with 85 t of rock/ore results in roughly 28 t of pure ores) we were also able to measure the gold content in some parts of the deposit. Au ranges between 10 ppm and 180 ppm at various parts of this area (in the mean-rate: ø 130 g/t Au; ø 70 g/t Ag). Such an estimate would end in a yield of 3.46 kg of gold and roughly 1.96 kg of silver. In general and according to the partly very high gold amounts we estimate at the moment a general output of something between 500 to 1000 kg of gold that once had been produced in Sakdrisi. According to about 700 to 800 years of production in Sakdrisi the calculation would end with an annual output of something around 1 kg. Further investigations have been performed by fire-setting experiments which allowed estimating all the efforts that very made with the single steps of gold-production from the preparation of the ore mining to the panning and smelting of the gold concentrates (Stöllner et all. 2012; 2014). If we take the earring of Paravani with a weight of 9.4 g of Au/Ag as an example, we could calculate its production efforts (further called the “Paravani” calculation”; named after the earring of Paravani-Khulgumo, see list Nr. 13). According to our experiments we could estimate 3.46 min for the production of 1 kg of ore/rock; for the separation and beneficiation work the value is much higher and can be estimated with 224 min for 1 kg (this is the real effort!). All these working steps take the same time whatever gold enrichment is in the ore-concentrate. But none the less the gold grade influences directly the amount of time to produce 1 g of gold: if one calculates the amount of time according to the enrichment of Ag/Au found in mine 1/2-N-extension, one could end up with 42 h to produce 1 g of gold. By considering these data we also get an impression how many people might have been involved to the production. If we take the Paravani-earring as an example: the heavy ring (9.4 g) would have needed at least 3 days by a group of 16 persons to be produced. Without integrating other data one could argue that expeditions could have sporadically reached the mining site to produce such items on special occasions (e.g. funerals, festivals, gifts and social processes of negotiation). But if one look to the general estimate of an annual yield of 1 kg of gold one would estimate the need of 16 workers to produce this amount within 330 working days with eight hours of permanent work. This is not little in a way that other parts of the community also had to provide the subsistence of the mining people. 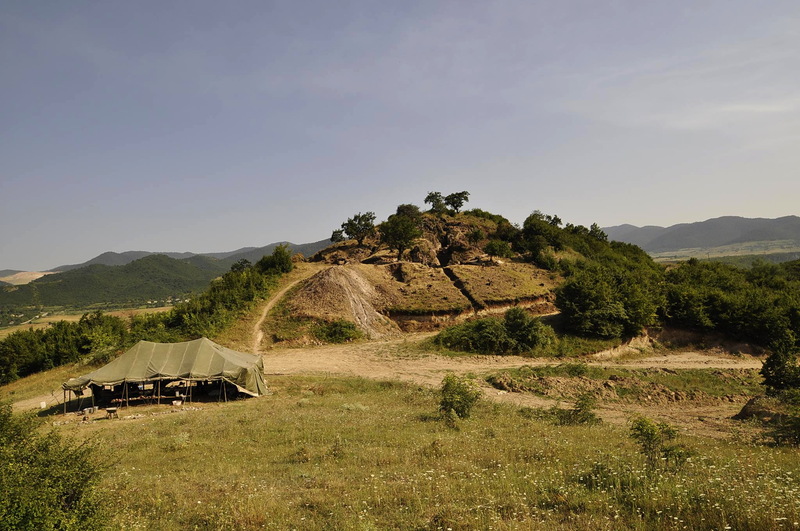 Such a sedentary group perhaps in a size of a larger village can be evidenced at the plateau of Balitschi-Dzedzvebi (Stöllner-Gambashidze 2011; Stöllner et all. 2014): But looking at the current evidence we do not know if the gold milling and smelting activities were carried out there seasonally or permanently and in which way of labour-division this was done. 5. Conclusions: Early precious metals in the Kura-Araxes and the early Kurgans: New grave rites of a renewed social complexity? Finally we may ask what has driven the Kura-Araxes societies in Transcaucasia and their neighbouring areas to appropriate metals to such larger extend at the end of the 4th mill. BC.? At the one hand it is easy to assume that spreading Kura-Araxes communities came in contact with pre-urban large scale settlements and their complex societal organisation at the upper Euphrates. It has been known for a long time that people with Kura-Araxes cultural tradition settled nearby and within the settlement in the Altınova (e.g. Norşuntepe) or at period VI B1 at Arslantepe but even get involved into the societies as part of them (see the inspiring discussion: Kohl 2009: 248-249): How else we should interpret the extraordinary funerary furnishing with Kura-Araxes vessels and other Caucasian elements in the so called “princely tomb” of Arslantepe (Frangipane et all. 2004)? However we interpret the evidence it cannot be denied that people from the north had contact with those societies and perhaps got stimulated by them. Though this may be an easy explanation for the renewed interest in metals and items of social prestige it is not convincing as the one and only reason. Perhaps we also have to look for the internal developments within the Kura-Araxes-communities. Let us look to the earliest items of prestige first. 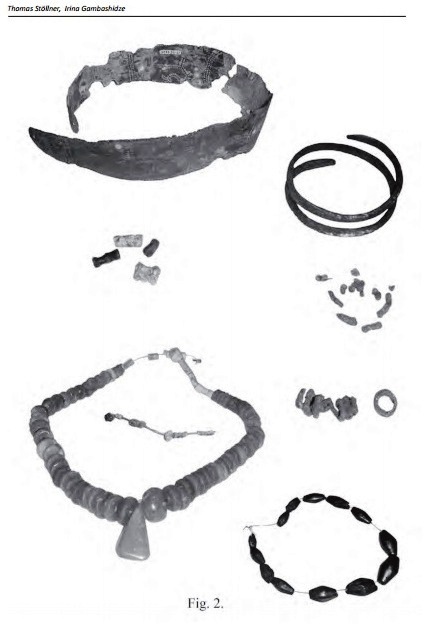 In the wider surrounding of the Sakdrisi gold mine there are only few prestigious metal artefacts of which the gold and silver beads of Soyuq Bulaq are the earliest from the early 4th millennium (Fig.7). Till now they are outstanding and it certainly would be of interest if they can be connected with the Madneuli/Sakdrisi deposits (for a silver enriched crucible from Balitshi-Dzedzvebi: Stöllner et all. 2014, 102 Fig.21b; in general for the silver: Courcier 2014: 623-636). But it is interesting that the next wave of precious metals (gold, silver and tin-bronze as well) appeared at the end of the 4th mill. 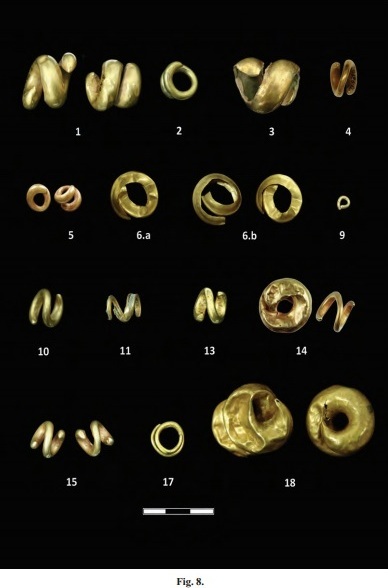 BC: most of the time these were spiral-rings (“Locken-/Schläfenringe”), a type that interconnects many societies especially in the 3rd millennium as a symbol (Primas 1995); spiral-rings of this shape are not known from the Near East but there is a considerable concentration in Transcaucasia (Fig. 7-8, see also catalogue), in the North Caucasus and furthermore in Eurasia and East Europe (Primas 1995). These golden items stood obviously at the beginning of a longer lasting tradition that had its climax with the Kurgan graves of the Martkopi-Bedeni stage in later Early Bronze Age and at the beginning of the Middle Bronze Age: it is interesting to see that – although many more expressions of social and ritual significance were added to the graves (adornment plates, discs, needles) later on – the spiral rings were still in use during that period. It is a symbol rather than just an adornment that stood in a longer regional tradition. It therefore seems rather likely that also the wish to use precious metals has evolved within the regional societies and was not mainly stimulated from outside. This observation does not only meet the spiral-rings but also other items of social prestige. If we look to graves like those of Kvazchela, Hasansu or Sachkhere (see catalogue) of the beginning of the 3rd millennium it seems that they stood at the beginning of the funeral tradition that found a further development and ritual variation in the Martkopi-Bedeni kurgans. We can only speculate if this development was paired with an increased social complexity and a higher societal competition that forced societies to increase their efforts for the “eminent dead”. However we explain this development it is convincing to think that such had its consequences also to the procurement of metals and metal ores like antimony, tin, silver and gold. If we look at the metal record of 3rd millennium Transcaucasia (Fig.1) it is rather striking that most of metal that were found in graves had more a symbolic than a functional use. Most of the finds are special in concern of their formal but also their alloy-composition. This makes it again obvious how limited our knowledge is in regard of the common metal use in those days. If perhaps the access to the gold deposits was rather limited and occasional at the beginning is open; but it may have changed at the end of the 4th millennium and during the first half of the 3rd. millennium when for instance the mines of Sakdrisi get exploited even more intensively. It seems that a part of the Mashavera communities were involved to something which now developed more and more as a regular social activity, perhaps even a “business”. And this may be true also to other mining areas such as the Racha-region where the Antimony was won for the first time. But still these questions await our further investigation to understand this fascinating period of change in socio-economic and technical access to new resources and ideas (in general: Hansen 2011). Fig. 1: Georgia, record of metals and metal alloys between the Neolithic and the end of the 3rd millennium, after the catalogue given in Gambashidze et al. 2010; graphics: authors. Fig. 2: Kvazchelebi, grave N2 (after Javakhishvili-Glonti 1962); Foto: I. Gambashidze, Tblissi. Fig. 3: Sakdrisi, Kachagiani hillock, state of the excavation of the Kura-Araxeses-mines A (right) and B (left) in 2013, Foto: DBM, Th. Rabsilber, Bochum. Fig. 4: Dating of Sakdrissi mines according the AMS-14C-datings (1σ and 2σ-range); MAMS: Mannheim Laboratory; ETH: Zurich laboratory; graphics: Th. Stöllner, Bochum. Fig. 5: Crucibles form the Dzedzvebi-settlement and analysis (Bochum laboratory) of the inside and outside surface; graphics: DBM and RUB Bochum; after Th. Stöllner et all. 2014, 96, Fig.21. Fig. 6: “Paravani” calculation to show which time was consumed to produce one gram of gold (according to the experiments carried out between 2011 and 2013; graphics: Th.Stöllner, Bochum. Fig. 7: Distribution of tin and golden spiral-rings in Transcaucasia during the 4th and the 3rd millennium (see catalogue list), graphics: Th.Stöllner, Bochum. 1. Anaga, Kacheti, Kurgan N1, deepened grave, spirals are made of a thin gold sheet; diameter: 1,1cm; unknown weigth; further finds: jug of Bedeni culture; further ceramical fragments; Literature: Pitskhelauri 1980; Gambaschidze et all. 2010: Nr.782. 2. Ananauri, Kacheti, Kurgan N2 (Fig. ?? ), massive spiral ring, weight: 8.09 g (86,4 Au; 12,9 Ag; 0,65 Cu); further finds: gold: pectoral, three needles with double volutes; 22 beads (double- conical); 33 biconical ones; 2 spherical ones, 23 cylindrical; two adornment discs; two grooved rings five rings with one groove; silver: two bracelets; two perforated pendants; 110 massive and 9 spherical beads; carnelian: 54 cylindrical and rhombic beads; copper: sheet-fragment; ceramic: sherds of different vessels; Literature: Picxelauri/Orthmann/Qvavadze 1994: 12 Fig.3; Gambashidze et all. 2010: Nr.595. 3. Dalismta, Kacheti, Kurgan N4, spirals are made of golden sheet around a copper core, weight: 4.65 g, as inventory further 15 golden beads also made of sheet gold covering over copper core, six adornment plates and a dagger blade (copper), three beads of carnelian; a bead slider, eight ceramic vessel; literature: Asatiani-Maisuradze 1992: 154. Taf. I,11; Gambashidze et all. 2010: Nr.736. 5. Hasansu, Agstafa region, grave, two spiral rings; weights: 3.9, 4 g of gold (93.52 Au; 6.41 Ag; 0.04 Cu); further finds: two daggers/spearheads, chisels, four rings; fat axe and shaft-tubeaxe (copper); two ceramic vessels; Literature: Museyibli et all. 2012: 97-108. 6. Irganchai, Kurgan N21, two spiral rings of gold sheet (89,50; 72,99 Au; 7,74, 19,29 Ag; 2,68, 7,70 Cu); further finds: ten ceramic vessel;; 14C-dating; 2578-2285 BC; literature: KachianiGhlighvashvili 2006: 207, Taf. III1; Gambashidze et all. 2010, Nr. 787-88 Tab.G V-77,a-c). 7. Karashamb,Kotayk region, Armenia, great Kurgan, end of 3rd mill., 4 grooved and hollow giold spirals; further finds: silver, large shaft-hole axe of Bedeni type, gold-sheets, disk with spiral decoration, five gold/silver, electron-needles, necklace with spherical gold beads, carnelian beads and pendants; necklace with adiornment plates, beads, carnelian beads and agate beads and conical pendants (agate); literature: Ognesian 1992; Gold of Ancient Armenia 2007: Tab. 6-11; Simonyan 2012. 8. Khankent, Stepanakert , Karabakh region, Kurgan 125; spiral-ring; from a Kurgan of the 2nd half of the 3rd mill. ; literature: Akhundov 2001, 79 Tab.5,3. 9. Koreti, Sachkhere, Imereti, outside of the Kurgan, various graves; massive spiral-ring, gold, weights; closed complexes (? ), finds from the first half of the 3rd mill. literature: Japaridze 1961, 137, Tab. XVIII-8; Gambashidze et all. 2010, Nr.277. 10. Martkopi, Kacheti, Kurgan N3, deepened grave; copper with golden sheet (Au 52.3, Ag 39, Ag, 7.3 Cu); diameter: 1,5; weight: 6.2 g; further finds: arrow-head; flag of copper; three ceramic vessels; Literature: Japaridze 1998, 35, Fig.24,45, Tab.XXII; Gambashidze et all. 2010, Nr.713. 11. Martkopi, Kacheti, Kurgan N3, main grave, spiral ring of copper and a golden sheet, weight 0,93 g (75.1 Au, 24 Ag, 0.8 Cu); further finds: copper, shaft-tube axe, chisel, awl, a spiral and two broken ones; bronze: flag; frit beads, carnelian pendant, jet ring, mother of pearl-plate; eight ceramic vessels; literature: Japaridze 1998, 35, Fig. 24,45, Tab. XXII; Gambashidze et all. 2010, Nr.719a. 12. Metsamor, Armavir region, Armenia, child’s grave, mid of 3rd mill. ; massive gold-silver spiral, literature: Gold of Armenia 2007, Tab.11,5. 13. Paravani, Akhali Khulgumo, Javacheti, Kurgan N1, massive spiral, weight 9,4 g (80.4 Au; 16,846 Ag, 2,478 Cu); further finds: two ceramic vessels; literature: Kvavadze et all. 2007, 100; Gambashidze et all. 2010, Nr.580. 16. Shengavit, Armenia, grave 1 (old excavations), two massive gold spirals, mid of 3rd millennium; literature: Gold of Armenia 2007, Tab. 11,3; for the site: Simonian 2002; Areshian 2006. 19. Talin, Aragatsotn region,Armenia, grave 11, spiral-ring (Cu+Sn (Ni), Sn=11% Ni=0,34%); further finds: not known to us; dating, 3330-2936 cal BC (2σ); literature: Meliksetian et all. 2011. Agricola, G. 1556, Zwölf Bücher vom Berg- und Hüttenwesen. Übersetzt und bearbeitet von C. Schiffner. Dtv Deutscher Taschenbuch: München. Akhundov, T. 2001, Severo-zapodny Azerbaijan v epochu eneolita i bronzy, Baku. Akhundov, T 2004, “South Caucasus in the Neolithic and Early Bronze Age: the question of epochs and periods”. In: A. Sagona (ed. ), A view from the highlands: Archaeological studies in honour of Charles Burney, Ancient Near Eastern Studies, Supplement 12, Leuven: Peeters, 421–435. Akhundov, T.I., Makhmudova, B. A. 2008: Juschnij Kavkaz v kavkazsko-peredneaziatskikh ethnokulturnykh prozessakh. IV. tys. do n.e. Baku. Asatiani N., Maisuradze B. 1992, Shiraqis archeologiuri expeditsiis 1985-1987 ts.ts. tsinastsari schedegebi. In : Works of Tblisi State University N 310, Tbilisi. (In georgischer sprache). Areshian, G. 2006, “Early Bronze Age settlements in the Ararat Plain and its Vicinity”. Archäologische Mitteilungen aus Iran und Turan. 37, 2005, 71-88. Bachmann, H.-G. 1999, “On the early metallurgy of gold. Some answers and more questions” In: A. Hauptmann, E. Pernicka, T. Rehren & Ü. Yalcin (eds. ), The Beginnings of Metallurgy. Proc. Intern. Conf. „The Beginnings of Metallurgy“. Der Anschnitt, Beiheft 9 (Bochum 1995) 267-275. Chernykh, E.N. 1992, Ancient Metallurgy in the USSR. Cambridge. Chabashvili, L. 2004, Tetri Qvebis gora samarkhi Nr. 4. Dsiebani 13-14, Tblisi. Chubinishvili, T. 1963, Amiranis Gora. Tbilisi. Courcier, A. 2014, “Ancient Metallurgy in the Caucasus From the Sixth to the Third Millennium BCE” In: B. Roberts, C. Thornton (eds. ), Archaeometallurgy in Global Perspective. Methods and Syntheses, New York: Springer, pp.579-664. Sadori, L., Schultz, M., Schmidt-Schultz, T. 2001, „New symbols of a new power in a “Royal” tomb from 3000 BC Arslantepe, Malatya (Turkey)” Paléorient, 27(2), 105–139. Gambaschidze, I., Hauptmann, A., Slotta, R., Yalçin, Ü. 2001, Georgien. Schätze aus dem Land des Goldenen Vlies. Katalog der Ausstellung Bochum. Veröffentlichungen aus dem Deutschen Bergbau-Museum Bochum 100, Bochum. Gambashidze, I., Mindiashvili. G., Gogotshuri, G., Kachian, K., Dshaparidze, I. 2010, Ancient metallurgy and mining in Georgia in the 6th to 3rd mill. BC (in Georgian), Tbilisi. Hauptmann, A., Gambaschidze, I. 2001, „Antimon – eine metallurgische Besonderheit aus dem Kaukasus“ In: Gambaschidze et. all. 2001, pp.150-154. Helwing, B. 2012, “Late Chalcolithic craft traditions at the North-Eastern “Periphery”. Origini 35, 201-220. Ivanova, M. 2012, Kaukasus und Orient: Die Entstehung des „Maykop-Phänomens“ im 4. Jahrtausend v. Chr. Praehistorische Zeitschrift 87, 2012, 1-28. Japaridze, O. 2013, Brinjaos industriis istoriisatvis udzveles Sakartveloshi, Tbilisi. Kawtaradze, G.L. 2001, „Die frühesten Metallobjekte in Zentral-Transkaukasien“ In: Gambaschidze et al. 2001, 136-141. Kavtaradze, G.L. 2004, “The chronology of the Caucasus during the Early Metal Age: Observations from Central Trans-Caucasus” In: A.Sagona (ed. ), A view from the highlands: Archaeological studies in honour of Charles. Kavtaradze, G.L. 2014, “Transcaucasia and the Problem of the Uruk Cultural. Phenomenon” In: Aynur Özfırat (ed. ), SCRIPTA Essays in Honour of Veli Sevin. A Life Immersed in Archaeology. Istanbul 2014, 13-20. Kvavadze, E., Kakhiani, K., Pataridze, N., Konnor, S. 2007, “The results of palynological investigation of Paravani Kurgan”. Proc. Georgian Acad. Sci., Biol. Ser. B, vol.5/2, Tblisi. Kohl, Ph.L. 2007: The Making of Bronze Age Eurasia. Cambridge World Archaeology, Cambridge, New York: Cambridge University Press. Kohl, Ph.L. 2009, “Origins, Homelands and Migrations: Situating the Kura-Araxeses Early Transcaucasian ‘Culture’ within the History of Bronze Age Eurasia”. Tel Aviv 36. 241-265. Miron, A., Orthmann, W. 1995, Unterwegs zum goldenen Vlies. Ausstellungskatalog Saarbrücken. Lomtadze G. 1999: Akhlad aghmochenili samarkhi Modinakhedan. In: Narkvevebi III. Tbilisi. Lyonnet, B., Akhundov, T., Almamedov, K., Bouquet, L., Courcier, A., Jellilov B., Huseynov F., Loute S., Makharadze Z., Reynard, S. 2010: “Late Chalcolithic kurgans in Transcaucasia. The cemetery of Soyuq Bulaq (Azerbaijan)”. Archäologische Mitteilungen aus Iran und Turan 40, 2008, 27-44. Lyonnet, B., Guliyev, F., Helwin g, B., Aliyev, T., Hansen, S., Mirtskhulava, G. 2012, “Ancient Kura 2010–2011: the first two seasons of joint field work in the southern Caucasus”. Mit Beiträgen von L. Astruc, K.Bastert-Lamprichs, W.Bebermeier, F.Becker, N.Benecke, L.Bouquet, G.Bruley-Chabot, A.Courcier, M. B. D’Anna, A. Decaix, J. Fassbinder, M.Fontugne, F.Geitel, A.Goren,C. Hamon, J.Koch, G. Le Dosseur, A. Lincot, R.Link, R.Neef, D.Neumann, V.Ollivier, P.Raymond, A.Ricci, A.Samzun, S. Schorr, F. Schlütz, L. Shillito, M.Ullrich, J.Wahl. Archäologische Mitteilungen aus Iran und Turan 44, 2012, 1-190. Majidzadeh, Y. 1979, “An Early Prehistoric Coppersmith Workshop at Tepe Ghabristan”. In: Akten des VII. Internationalen Kongresses für Iranische Kunst und Archäologie, Munich, 1976, Archäologische Mitteilungen aus Iran, Ergänzungsband 6, Berlin, 82-92. Makharadze, Z. 2007, „Nouvelles données sur le Chalcolithique en Géorgie orientale“. In: B.Lyonnet (dir. ), Les cultures du Caucase (VIe - IIIe millénaires avant notre ère). Leurs relation avec le Proche-Orient. ERC: Paris 2007. Maisuradze, B., Gobedschischwili G. 2001, „Alter Bergbau in Ratscha“ In: Gambaschidze et all. 2001, 130-135. Meliksetian, Kh., Kraus, St., Pernicka, E., Avetissyan, P., Devejian, S., Petrosya, L. 2011, “Metallurgy of Prehistoric Armenia” In. Ü. Yalcin (ed. ), Anatolian Metal V. Der Anschnitt, Beiheft 24, Bochum, 201-211. Miron, A, Orthmann, W. (eds.) 1995, Unterwegs zum goldenen Vlies. Archäologische Funde aus Georgien, Saarbrücken. Mujiri, T.P. 1987, Vyjavlenie pamjatnikov gornorudnogo proizvodstva Gruzii epochi pozdnej bronzy-rannego scheleza. Unpublished Report Institute Gornoj mechaniki Im. G.A. Zulukidze, Tblisi. Museyibli, N. 2007, Böyük Kəsik. Eneolit dövrü yaşayış məskəni, Bakı. Museyibli, N.A. Akhundova, G.K. Aghalarzadeh, A.M. 2012, “Burial monuments of the Bronze Age of Agstafa region”. Azərbaycanda Arxeoloji Tdqiqatlar 2011, Baku, 97-108 (in Azerbaijan language). Muscarella, O. 1969, “The tumuli at Sé Girdan. A preliminary report”. Metropolitan Museum Journal 2, 5–25. Muscarella, O. 1971, “The tumuli at Sé Girdan: second report”. Metropolitan Museum Journal 4, 5–28. National Academy of Science Republic of Armenia (ed.) 2007, The Gold of Ancient Armenia (in Armenian language). Gitutyun Publishing house: Yerevan. Nebieridze, L. 2010, The Tsopi Chalcolithic Culture (in Georgian). Studies of the Society of Assyiologists, Biblical Studies and Caucasiologists 6, Tblisi. Pernicka, E. 1997, „Die Ausbreitung der Zinnbronze im 3. Jahrtausend“. In: B. Hänsel (ed. ), Mensch und Umwelt in der Bronzezeit Europas. Abschlusstagung Die Bronzezeit: Das erste goldene Zeitalter Europas, Berlin, Kiel, 135-147. Pernicka , E., Eibner , C., Öztunali , Ö. & Wagner , G.A. 2003, “Early Bronze Age Metallurgy in the Northeast Aegean”. In: G.A. Wagner, E. Pernicka, H.P. Uerpmann (eds. ), Troia and the Troad, Berlin Heidelberg New York: Springer, 143-172. Pitskhelauri, K. 1980, Kakhetis archeologiuri expediziis 1979 (unveröffentlicht). Picxelauri, K., Orthmann, W., Qvavadze, D. 1994, „Neue archäologische Funde in Kachetien“. Georgica 17, 9-13. Primas, M. 1995, Gold and silver during the 3rd Mill. cal. B.C. In: G. Morteani, J.P. Northover (eds. ), Prehistoric Gold in Europe. Nato Science Series 280, New York: Springer, 77-96. Simonian, H. 2002, “The Stratigraphy, Building and Construction Principles of Shengavit” In: The Ancient Culture of Armenia 2. These of the Scientific Forum to the Emma Khanzadian’s jubilee, Gitutyun Publishing house: Yerevan, 2-5. Simonyan, H. 2012, Archaeological Heritage of Armenia, Yerevan. Stöllner, T., Slotta, R., Vatandoust A., (eds.) 2004, Persiens Antike Pracht, Ausstellungskatalog. Veröffentlichungen Deutsches Bergbau-Museum Bochum 128, Bochum. Stöllner, T., Ġambašiże, I., Hauptmann, A., Mindiašvili, G., Gogočuri, G., Steffens, G. 2010, „Goldbergbau in Südostgeorgien – Neue Forschungen zum frühbronzezeitlichen Bergbau in Georgien“. In: S. Hansen, A. Hauptmann, I. Motzenbäcker, E. Pernicka (eds. ), Von Majkop nach Trialeti – Gewinnung und Verbreitung von Metallen und Obsidian in Kaukasien im 4.-2. Jahrtausend v. Chr. Beiträge des internationalen Symposiums in Berlin vom 1.–3. Juni 2006. Kolloquien zur Vor- und Frühgeschichte 13, Bonn: Habelt, 103-138. Stöllner, T., Gambashidze, I. 2011, “Gold in Georgia II: The Oldest Gold Mine in the World” In: Ü. Yalçın (ed. ), Anatolian Metal V. Der Anschnitt, Beiheft 24, Bochum, 187-199. Stöllner, T., Craddock, B., Timberlake, S., Gambashidze, I. 2012, Feuersetzen im frühesten Metallerzbergbau und ein Experiment im frühbronzezeitlichen Goldbergbau von Sakdrisi, Georgien. In: K. Oeggl, V. Schaffer (eds. ), Die Geschichte des Bergbaues in Tirol und seinen angrenzenden Gebieten. Proceedings 6. Milestone-Meeting Klausen 2011, Innsbruck: University Press, 65-77. Stöllner, T., Craddock, B., Gambaschidze, I., Gogotchuri, G., Hauptmann, A., Hornschuch, A., Klein, F., Löffler, I., Mindiashwili, G., Murwanidze, B., Senczek, S., Schaich, M., Steffens, G., Tamasashvili, K., Timberlake, S. 2014, “Gold in the Caucasus: New research on gold extraction in the Kura-Araxeses Culture of the 4th millennium BC and early 3rd millennium BC. With an appendix of M. Jansen, T.Stöllner, and A. Courcier. In: H. Meller, E. Pernicka, R. Risch (eds. ), Metalle der Macht. Tagungen des Landesmuseum s für Vorgeschichte Halle 11, Halle, 71-110. Tylecote, R.F. 1987, The Early History of Metallurgy in Europe. Longman Archaeology Series: London. Wolf, D., Borg, G., Meliksetian, K., Allenberg, A., Pernicka, E., Hovanissyan, A., Kunze, R. 2013, „ Neue Quellen für altes Gold?“ In: Archäologie in Armenien 2. Veröffentlichungen Landesamt Denkmalpflege Archäologie Sachsen-Anhalt 67, Halle, pp 27-44. Many thanks to Prof. Dr. N.Museyibli, Baku, for giving us the possibility to work with the collection of Hasansu. We are most grateful to Prof. Dr. T. Akhundov, Baku, to have shown the fascinating finds from Alkhantepe. Delisi: Gambashidze et al. 2010, Nr. 12, 14; Miron- Ortmann 1995, 318, Kat.Nr. 335; recent Pb-Isotope studies in Bochum (pers. Comm. A. Hauptmann) of these two awls indicate that the tin containing ores (probably stannite) might have derived from the Lesser Caucasus and their polymetallic deposits; it therefore should by regarded as a natural alloy that was perhaps deliberately chosen but unlikely deliberately composed.